Eight kilometers out from the seaside town of Plettenberg Bay in the Western Cape, a pretty peninsula called the Robberg, points like a finger out into the sea. On its wild side western flanks, waves pound like fists against rugged rust coloured cliffs, whilst on the eastern side a sweeping bay maintains an aquatic ambiance of calmness and serenity. There, in the quiet still waters of Plettenberg Bay, whales like to hang out, as do dolphins, seagulls, seals, and sometimes even sharks. 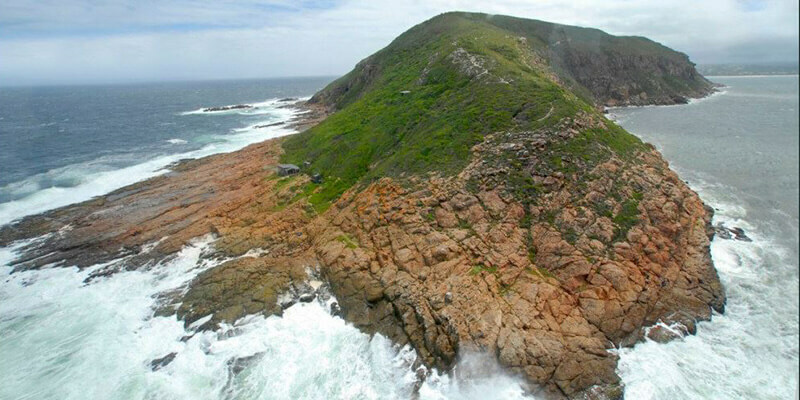 On the weathered side (The Ying to the Bay side’s Yang) you can stand atop the Robberg escarpment and often see dolphins surfing in the huge surge below. It truly is a beautiful place:- A real South African gem. Its also an all year round destination. Summer for the glorious beaches and pleasant strolls. Winter for the dramatic seas and the big splashy cetaceans. Coastal fynbos covers the majority of this sandy sanctuary in a shimmering flowering carpet, whilst up on the cliffs of jagged rocks, hardy little succulent plants can be found eeking out a living. One who takes the time to investigate the finer details of the Robberg will be rewarded with flowering vygies, strandloper middens, and rockpools full of tentacular wonders. Bait collecting is illegal (it is a Nature Reserve after all) and because of this, every rock pool is an aquarium, alive with plants and animals. 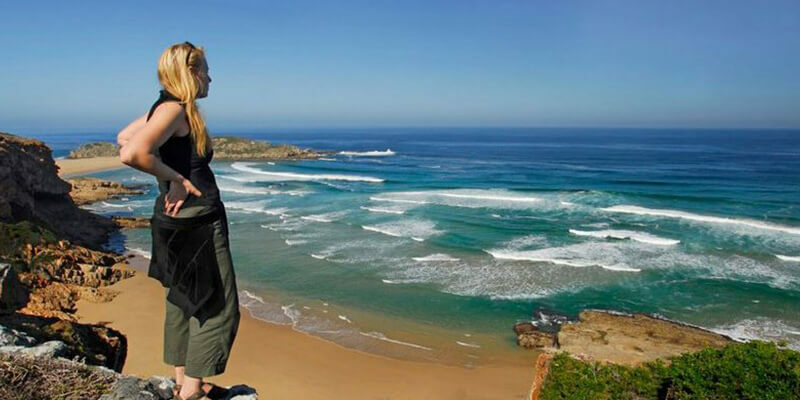 Managed by Cape Nature, the Robberg Peninsula is not only a sanctuary for plants and animals (both terrestrial and marine) but also a sanctuary for the human body and soul. Its a fantastic escape from the sophisticated hustle and bustle of Plettenberg Bay, and can be easily visited within 30 minutes from town. As well as three excellent and distinct hiking trails, the Robberg also has an archeological dig site (where primitive man once resided) some beautiful dunes, and a very large and smelly seal colony. The ‘Rob-Berg’ in Dutch, literally translates to ‘Seal Mountain’: a testimony to how many of these animals live here. There’s a vantage point on a hiking trail which is situated above this rambunctious mass of animals, which is one of my favorite spots on the whole of the South African coastline. So with that in mind, on my most recent visit to the Robberg, I sipped my early morning coffee on the stoep of the Fountain Shack Hut and watched the sun come up before heading off on a hike to where the seals hang out. Seagulls followed me like shadows, hopeful I would fling them breakfast scraps, but I ignored them as one does a nagging child in a sweet shop. It was a nice walk, it always is, and along the way I saw blue duiker and dassies and a little striped mouse, and after a bit of uphill huffing and puffing, I soon reached my very favorite vantage point up above the seals. There I made myself comfortable, nibbled selfishly on a sandwich (much to the dismay of the gulls) and sat quietly with my binoculars trained upon the frenetic action below. Seals were crammed against the cliffs like Christmas shoppers at a mall, jostling and bickering like old married couples. Mothers tended their pups with affection whilst boisterous youngsters played together in the sea. Apparently, or so I am led to believe, there are some people out there who aren’t all that enamored by seals. They say they are too smelly; and that they are noisome vermin who litter the beaches and eat far too many fish. But, to them, I say “Nonsense! Scientists have researched the Robberg seal’s diet and have discovered that they are not competing with the local fishing industry. They also boost Plett’s home-grown economy through tourism. Seals are full of spirited energy and it is a wonderful experience to visit the Robberg colony and witness their rambunctious aquatic play. Calling for a cull is misguided. From Plettenberg Bay harbor, you can partake in daily boat trips to the Robberg to view the seals there, or else go snorkeling with them. Its an amazing, if not somewhat overwhelming, experience. Seals are curious and high-spirited creatures by nature (especially the young ones) and when you get into the water with them, they will swim over to check you out at close quarters….Sometimes hundreds of them at a time. A snorkeling trip to the Robberg is akin to going for a swim with thousands of playful aquatic puppies. Its Magic! Pure, pure magic! But not so many years ago, there were no seals at all on the Robberg Peninsula. Hard to believe when you see the thousands that are living there now. But since the 17th century and up until relatively recently, Cape fur seals were being clubbed with such ferocious and commercial efficiency that by 1908 the ‘Seal Mountain Peninsula’ was completely bereft of all things flippered. But in 1996, sixteen years after Cape Nature took up stewardship of the Peninsula (and four years after the nationwide ban on seal killing came into play) the first seal in nearly 90 years hauled ashore and decided to stay. For the following few years, only a handful of bulls came each year, but eventually more began to show up and now the population is growing and growing. Plettenberg Bay has recently become an international ‘Hope Spot’ a titular award in line with the UNESCO World Heritage labeling; and it’s a title well deserved. What it means is that Plettenberg Bay; its dynamic marine environment; Its whales and dolphins and seals and sharks, and most of all, its local attitude towards ‘living amicably with nature’ has put it on the international map as a progressive and nature friendly place to visit…..and a great deal of that comes from the fact that the Robberg Peninsula is a dominant feature of Plettenberg Bay. 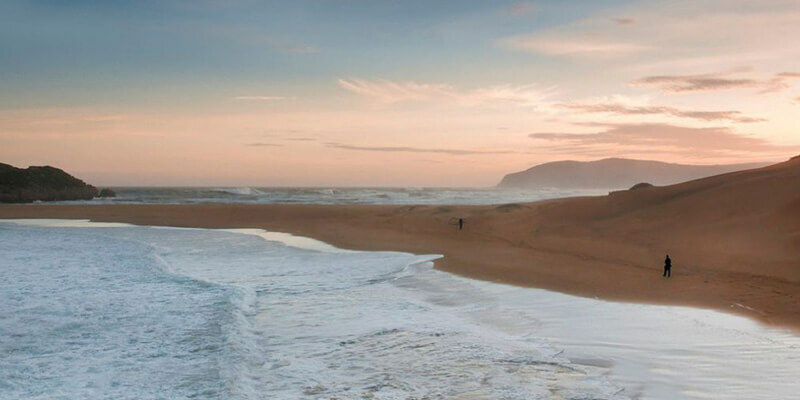 Next time you visit this alluring seaside town for your summer (or winter) Jols, make sure you take a side trip to visit the Robberg: you’ll surely leave as enamored with this place as I am… And you’ll want to come back time and time again. 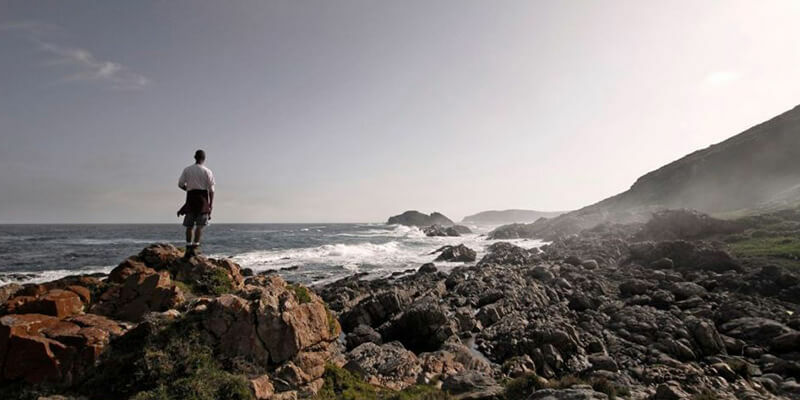 Not everyone likes to hike, and besides, some of the trails on Robberg can be quite a challenge and are not recommended for children, frail people or fatties. But fear not, the delights of the Robberg are not denied you for there are plenty of boating options out of Plettenberg bay. 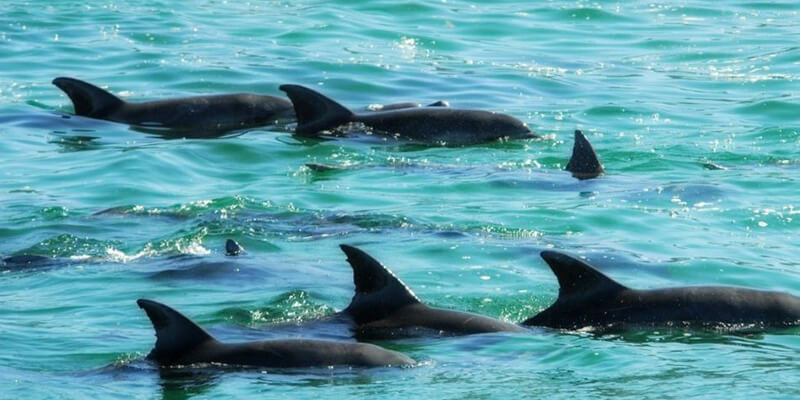 Fishing off a boat in the waters around the peninsula is not permitted but one can visit on a dolphin tour which depart regularly from Plettenberg’s main beach. The more adventurous can go visit by sea kayak (minimum age 14)- a magical experience which often leads to wonderful close up encounters with dolphins, whales, sharks and of course, the Robberg Peninsula seals.